Microformats are small patterns of HTML to represent commonly published things like people, events, blog posts, reviews and tags in web pages. Microformats are the quickest & simplest way to provide an API to the information on your website. See what else you can do with microformats. First time visitors, see also the introduction page. originally written by Dan Cederholm with help from Tantek Çelik for the launch of microformats.org on June 20th, 2005. Microformats are simple conventions for embedding semantics in HTML to enable decentralized development. from someone on the microformats-discuss mailing list. Please link/cite if you know the origin of this. Mostly seems to originate from Dr Ernie Prabhakar but with some later development. Microformats are simple codes that you can use to identify specific kinds of data, like people or events, in your webpages. Microformats are the way to publish and share information on the web with higher fidelity. For example, if a company wanted their contact information to be easily found and shared, they would publish it with hCard. Similarly if an organization is planning a series of events and wants more people to know about them and add them to their calendars, then they would publish their events listing with hCalendar. For advocacy groups, whenever they take a position on some political leader, some piece of legislation etc., if they wanted their evaluations/reviews/ratings of those people/laws to be more easily found and passed around, they would publish such opinions with hReview. For all of these, to make it easier, publishers can use tools and services that support microformats. The key here is that microformats are simple/easy enough that the any organizations own web authors/designers can easily add them in themselves. Adding microformats is easier than publishing an RSS feed for example. You don't have to be a programmer. Anyone with decent (X)HTML+CSS authoring/writing skills can use microformats. Pretty much anyone who is literate can be taught how to author HTML+CSS, and thus microformats makes use of very widely available skill sets. From an IRC conversation 2006-06-06 which helped "knowprose" grok microformats. Update 2006-06-07: knowprose's blog post Making Sense of Microformats: Have Data, Will Find It. microformats are carefully designed (X)HTML class names that extend the semantics of (X)HTML and enable authors to publish higher semantic fidelity content such as people, events, reviews, etc. From an IRC conversation 2006-07-28 with tcaspers on irc.freenode.net/#wasp. a microformat is way of adding more meaning to web pages beyond normal HTML headings and paragraphs, so you can indicate mentions of people, companies, events, reviews, tags, etc. From an instant message conversation 2007-07-06. Microformats are a way of attaching extra meaning to the information published on a web page. This extra semantic richness works alongside the information already presented, and can be used for the benefit of people and computers. This is mostly done through adding special pre-defined names to the class attribute of existing XHTML markup. microformats are evolving frameworks for how to present commonly used data items. For e.g. hCard microformat provides framework to capture a person's details First, middle, last name,company, contact info etc. Microformats are a way of adding simple markup to human-readable data items such as events, contact details or locations, on web pages, so that the information in them can be extracted by software and indexed, searched for, saved, cross-referenced or combined. More technically, they are items of semantic markup, using just standard (X)HTML with a set of common class-names. They are open and available, freely, for anyone to use. Microformats are simple standardized annotations of content available on the Web that provide a practical solution today to more productive and decentralized Web-based information search and sharing. In other words, Microformats allow you today to copy/paste information from a Web page, for instance someone's contact information from their blog to your address book, instead of manually retyping it. Eventually, microformats will allow anyone to make the information they publish easily sharable and searchable (products, events, resume, etc.) without having to duplicate and maintain up-to-date their data in centralized databases. A microformat is a specific collection of names, values, and accompanying structure defined through rigorous market research intended to consider pervasive use of semantic html that increases data fidelity in HTML-borne data widely distributed on the web. 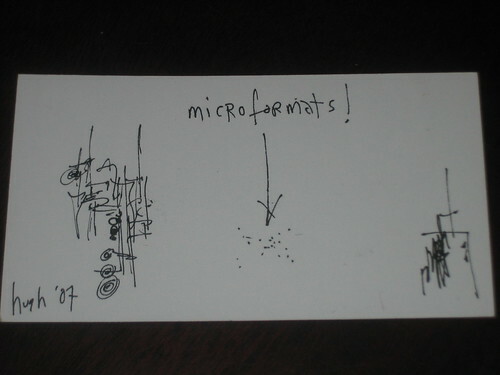 Microformats are more than one of these, eg "hcard and hcal are microformats." microformats are semantics with momentum, a codification of what everyone did anyway. They are what works, written down. Microformats are frames for your contents. Using microformats you tell, in a way both humans and machines can understand, what is the basic meaning of what you are writing in a web document. Microformats are a guarantee that anyone who wants to can grab certain types of data from your website without worrying much that a site redesign will require the to build a whole new parser. Microformats is to people and comptuers what Java is to operating systems. Java programs are written once and run on Mac, Windows, Linux, Solaris, etc. Microformats-enabled web pages are written once and are understandable by both humans and computers. You know all that stuff you already have on your website? Microformats tell computers what that stuff is. microformats are a set of rules that utilize present technology to make it not only more easily interactive, but human-friendly as well. microformats uses long standing practices of good web design techniques combined with simple changes in coding to make content far more than just plain text. Microformats are the incarnation of Semantic Web in the XHTML standard, they make text surrounded by markup relevant to its meaning and not its markup. The standardization effort that is collected here is the embodiment of the new Web 3.0. Microformats are helpful in creating rich snippets for websites, by virtue of this search engines can pull reviews and also people's data enabling readers to see useful information.